Can anyone tell me anything about this boat? I just bought it from a man that just got it from his 95 year uncle that had it built around the 50's or 60's. His uncle died before he could ask about the boat. Here are some more pictures, maybe you can tell from these what the make is of this boat. I'm going to restore her and would like to get an idea of the value before I start to pull her apart. This is my first time restoring so if you have ANY advice it would be greatly appreciated. After looking at the photos you attached; the shape (high freeboard, high barrel-back) could be a "Shepard" (Canadian Co.). What doesn't match either the "Shepard" or "baby Gar" (as previously suggested) is the transom (I/O) fittings. So, that would lead one to believe it was modified during it's life. Could it be a Correct Craft?? Hello again! 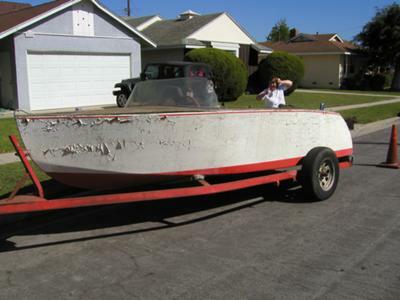 We are once again trying to find a new owner for the boat. I have found photos at correctcraftfan.com that have me wondering if it is possibly a Correct Craft Atom Skier. We have not located the nameplate yet, but I did discover the engine reads "STAR MARINE ENGINE OAKLAND CALIFORNIA"
We want to send her off to a good home but like everyone in this economy we could use a fair price for her. I was able to remove most of the paint and the hardware - this project needs a new home! All the wood is in Great condition, motor looks like it has everything, don't know if it runs. I am looking to sell to someone that can give her the loving care she deserves. Please watch for our "For Sale" post on this website or call Nancy at 619-742-4949. My advice, based on some recent experience of restoring a boat, goes like this. Unless you are a perfectionist (and my suggestion is to resist the temptation to become one) a bit of varnish under under paint will not hurt, and if you overpaint onto well cured varnish it is easy to clean up. If you are skilled with a paint brush you probably will not need to apply masking tape, except for making lines or other features. Be patient! If you think it is too hot or too cold or too wet to paint, then it probably is. Wait until conditions are just right. Consult paint manufacturers' web sites or literature for information on paint preparation, application temperatures and techniques. I used International (Interlux) paints and found a wealth of good information on the International site, and their product appears quite satisfactory, though not cheap! Experiment with your materials on some scrap timber before approaching the boat. Estimate how much time you think the job will take, then multiply by five. The moment I saw this picture I thought it was a Baby Garwood. Almost looks like a Besotes, they had steel frames. It looks like there is the logo for the Wilcox-Crittenden company in the center of the wheel. It would be the letter W inside the letter C.
Wilcox-Crittenden manufactured marine hardware starting in the 1800's up until a few years ago. The Thetford company still manufactures some of the marine toilets that Wilcox made. this is another good site. Thank's for sending the extra photos Nancy. Wow, I love that wheel! 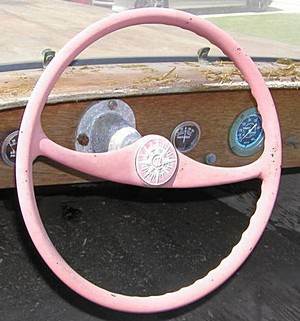 She has to be worth restoring if only for that and I guess it is going to dictate the future colour scheme. Well it looks as though you won't have much trouble getting the paint off. She could be a "Garwood" as Bill suggests. Have a look through the boats at Antique Boats you might be able to see something similar and it will give you an idea of her value. The way the transom curves inward on this photo makes me think Garwood? If you "google" garwood boats you will generally see this inward curve. Again from one pic it's hard to say. That looks to be a great little boat you have just bought. You will be amazed what some new paint and varnish can do for an old boat. If this Uncle had her built by a professional builder there should be a Builders Name Plate somewhere. She may have been built to one of Glen L's classic designs. Andrew is building a Malahini which is one of their designs. Tell us a bit more about her. How is she built, (plywood on a frame)? And what are your plans for her?